So as I’ve said many times (here, and here, and here), one of the greatest joys of being involved in the Philadelphia Writers’ Conference is the opportunity to meet some great people. Austin and Denise Camacho, who both participated in the 2014 conference (Austin as a workshop leader, Denise in our agents and editors panel), are a veritable literary power couple. Austin, who has the coolest name in the business, writes thrillers, including the Hannibal Jones series and the Stark and O’Brien adventure series. His newest novel, Beyond Blue, will be released in September 2014. Denise has worked in the publishing realm for a decade. Together, they formed Intrigue Publishing, a small house dedicated to publishing the finest crime fiction, young adult, contemporary drama, and sensual romance the world has to offer. Both Austin and Denise were all over the conference, offering advice, reaching out to newer writers, and in general raising the energy and the positive vibes throughout the entire weekend. I had asked Austin and Denise if they’d share some of there wisdom garnered by over a decade in the biz… Find out what they had to say after the break! What defines a “Thriller” today? Austin: I think just about any piece of fiction that gets your heart racing (erotica excepted) is a thriller. Generally the protagonists are either dealing with catastrophe or trying to prevent a catastrophe. Today the stakes in thrillers are often very high, although Lee Child’s Jack Reacher stories prove that smaller adventures are still very popular. I think as long as the story hinges on tension and suspense, and supplies some excitement and action, it’s a thriller. Any interesting stories from this year’s International Thriller Writers’ conference? Austin: A woman in the audience of a panel I was on said she was married to a man with my last name, and has a character with my surname in her novel. When I commented that I thought I had an unusual name, I learned that everyone on the panel knew a Camacho. One fellow said the most difficult arrest he ever made was a guy named Camacho. For a while my name was the topic of the panel! More important: the editor of Suspense Magazine approached me for an interview, and both Jon Land and John Gilstrap agreed to review my next novel, Beyond Blue, coming out in September. Denise: I was unfortunately unable to go to Thrillerfest this year but I can tell you that last year I met some amazing people and made some connections that have been very helpful for not only the publishing business but also for the Creatures, Crime & Creativity Con that Intrigue is sponsoring in October. 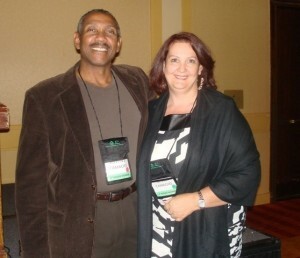 I met Rebecca York last year and she graciously accepted my invitation to be our keynote along with John Gilstrap. It is always not just a good time at Thrillerfest but it is a networking bonanza that I can pretty much guarantee Intrigue will be at every year. What was the impetus for starting Intrigue Publishing? Austin: After years of submission to agents and publishers, followed by a decade of successful self-publishing, we decided to try to offer upcoming authors what I always wished I had found – a press that cares about and respects its authors. Denise: For my part I really wanted to give back to authors and at the same time give a voice to a press that invests time, money and experience into making a quality product for readers. We take a lot of pride in the books we publish. Once readers become aware of that it is our hope they will continue to follow our company’s authors to find out the next great book for their libraries. What common mistakes do you find from people submitting their work? Austin: a) Too many authors don’t research the publisher. Don’t send it if it’s not one of the genre we publish. b) Many don’t follow the submission guidelines. In addition to great writing, publishers want writers who can follow instructions and pay attention to details. c) Incredibly, writers don’t read their own work enough. The best story on earth doesn’t justify poor spelling and grammar. d) Writers don’t understand the purpose of the synopsis. I need to know the genre, page count, audience, and primary plot line right away. You’re both always moving, always promoting – how important is that to writers now? How does it differ from the publishing world a decade ago? Austin: Promotion is vital to book sales today. Not that long ago most books were purchased in bookstores. Readers got to know the bookseller, whose recommendations often prompted purchases. Publishers would tour their more successful writers so that readers could meet and hopefully become attached to them. Today publishers only send their mega-sellers on tour, and with far fewer bookstores most books are purchased on line. Therefore it falls to the author to get the attention of readers and try to bond with them. Denise: As the President of the company it is my job to get out there and represent our brand, which is what I also expect from our authors. It is also my job to find great authors, not just great books, but authors that will be able to market their books as much as possible in this electronic and multi-media environment. In order to do that I have to put myself out there as much as possible to show that our company is one they will want to work with because we care about them and their work. We do not have the luxury of just sitting back and hoping that a distributor will put all of our books in bookstores and readers will buy them as was the past publishing environment. Luckily we also have an amazing marketing director, Sandra Bowman, and with her help we have moved our company into the social media world with little difficulty. You both wear many hats (author, agent, editor, publisher) how does that impact your perspective of the writing world? Denise: the experience we have gained through wearing so many hats has given us a perspective many other publishing houses don’t have. Being able to see the different sides of the business make us effective at spotting great authors and books. Now we just need readers to realize that the product we put out is better than many other houses so stay tuned for more great things from Intrigue. Bookmark Intrigue and find out why everything we do is worth reading! For more information about Austin, visit his website www.ascamacho.com, follow him on Twitter, and like his author’s page on Facebook. Check out Denise’s LinkedIn Page and learn more about Intrigue Publishing at www.intriguepublishing.com!